The Dimethylformamide, which we offer, is processed using the best chemicals that are sourced from reliable Vendors. We are a trustworthy Supplier and Exporter of Dimethylformamide. Definition : Dimethylformamide is the organic compound with the formula (CH3)2NC(O)H. Commonly abbreviated DMF (though this acronym is sometimes used for dimethylfuran), this colourless liquid is miscible with water and the majority of organic liquids. DMF is a common solvent for chemical reactions. Pure dimethylformamide is odorless whereas technical grade or degraded dimethylformamide often has a fishy smell due to impurity of dimethylamine. 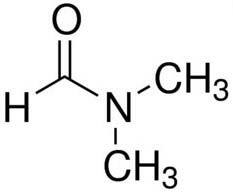 Its name is derived from the fact that it is a derivative of formamide, the amide of formic acid. Dimethylformamide is a polar (hydrophilic) Aprotic solvent with a high boiling point. It facilitates reactions that follow polar mechanisms, such as SN2 reactions. Dimethylformamide can be synthesized from methyl formate and dimethyl amine or reaction of dimethyl amine and carbon monoxide. Dimethylformamide is not stable in the presence of strong bases like sodium hydroxide or strong acids such as hydrochloric acid or sulfuric acid and is hydrolyzed back into formic acid and dimethylamine, especially at elevated temperatures.